What you are looking at above is the state of the Tesla Supercharger network on The last day of 2013/first day of 2014. 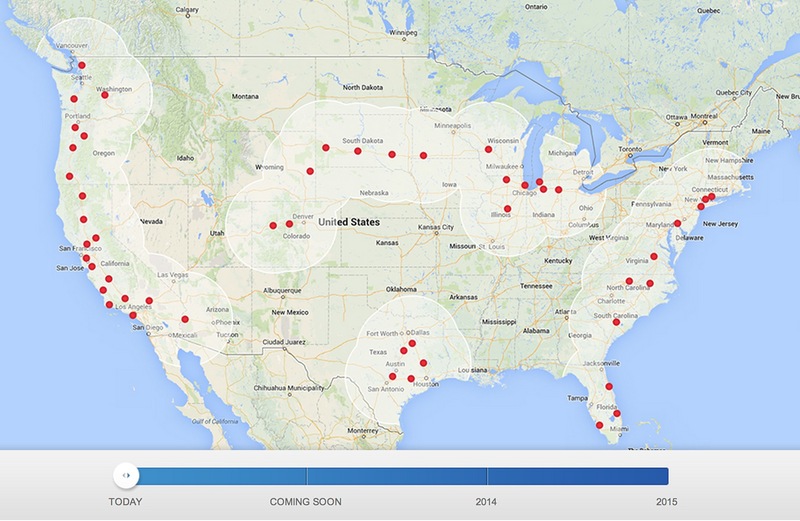 Tesla counts 50 Superchargers in the US (1 per state!) and another 14 in Europe. While Elon Musk originally planned to take his family on a Christmas holiday across the country, there are still some rather big holes to fill. Those holes all fall in the “coming soon” category and if you take a look at this helpful 3rd party map, you can see a lot of the country is still being built. * A wipers service mode. Who would’ve know? 🙂 * A reset TPMS button. Nice. * MAC Address display in Wifi settings. Who was it again asking for this to setup their router’s MAC filter? + all the goodies which were already in 5.6, of course. Also – it seems to accelerate a little smoother all of a sudden but that’s likely just me being overly sensitive. 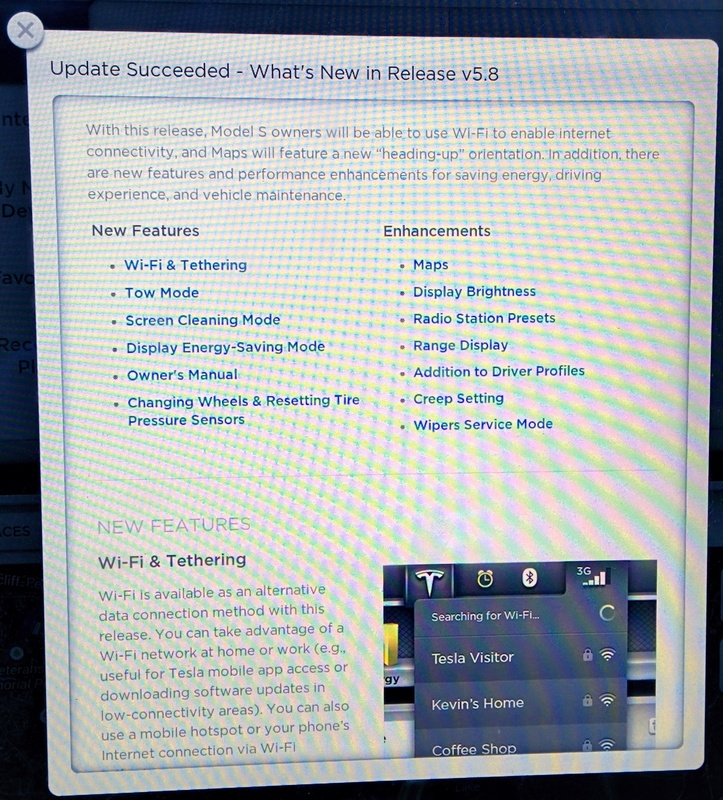 I just got my 5.6 firmware update without calling Tesla. I was on 4.5.1 previously. It took about 20 minutes to install after a 2 minute shutdown procedure. After the update I got the screen above. I did have some trouble connecting to my home Wifi networks as you can see toward the end there. I’m going to give it another try tomorrow, I wonder if it isn’t encryption problems. I also want to try a Verizon LTE Mifi. I really love the updates to maps. Right away I can see the usefulness of the compass and directional UI. I know 5.6 has been rolling out to Europeans for around a month but I don’t know many folks stateside that have it via OTA without it being pushed for issues. In case you are wondering, that Yugo-looking EV is called the Buddy EV. The Norwegian electric vehicle’s range is 25-60 km (16 to 37 miles) via a 13 kW motor, and has a max speed of 80 km/hr (50 mph) while under 100 inches long. No wonder the Tesla is doing so well in Norway. You don’t capitalize that ‘X’ by accident. 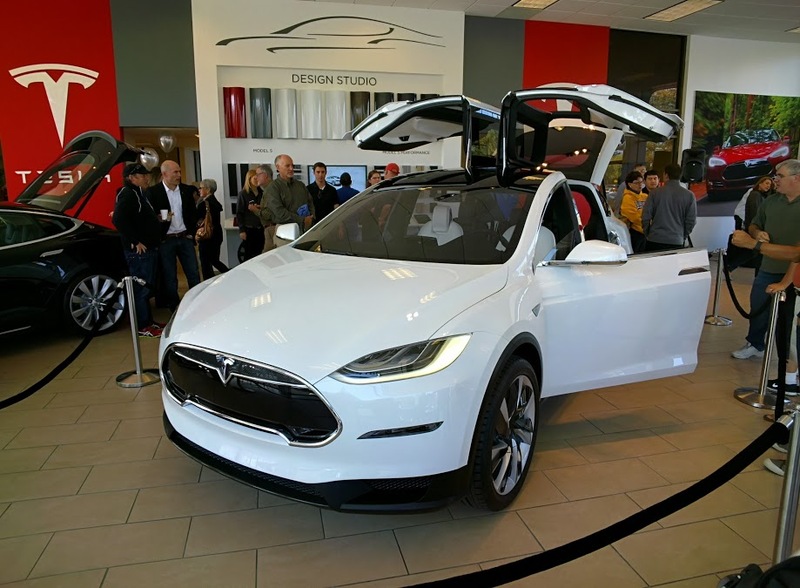 Tesla’s Model X is a crossover/SUV built on the Model S frame with more headroom, gull falcon wing doors in the rear and room for 7 or 8 adults. 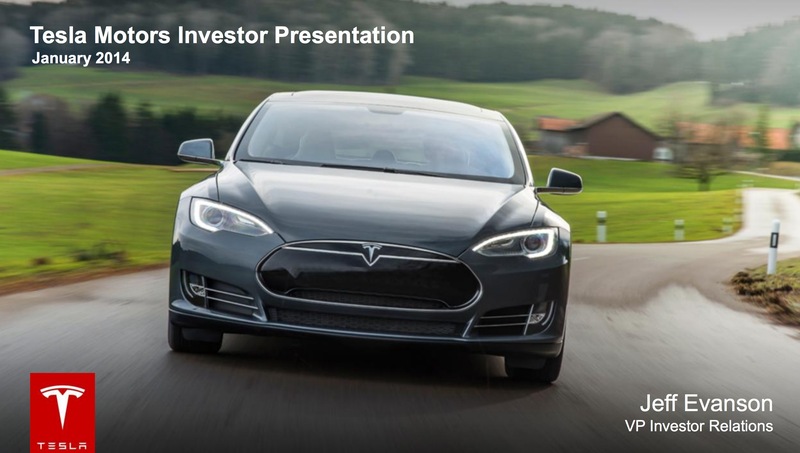 Tesla pushed the rollout of the X back to focus on meeting Model S supply but the product is due next year and can be reserved for $5000-$40,000. Update 2: Here’s a picture of the Model X care of Sahas Katta the guy who made the Tesla Glass App. Big Gallery at the Merc News. If you wonder about the Solar future of vehicle transportation, this is where you should start. The World Solar Challenge has a great deal of innovation in the solar field as well as pushing innovation in efficiency and recovering electricity for electric cars. In friendly competition with others attempting the same goals, the teams depart Darwin aiming to be the first to arrive in Adelaide, some 3000km to the south. It’s all about energy management! Based on the original notion that a 1000W car would complete the journey in 50 hours, solar cars are allowed a nominal 5kW hours of stored energy, which is 10% of that theoretical figure. All other energy must come from the sun or be recovered from the kinetic energy of the vehicle. These are arguably the most efficient electric vehicles. Having made the journey to Darwin by successfully navigating quarantine, customs, scrutineering, safety inspections and undertaken event briefings, participants are ready to start their epic journey. The elite Challenger class is conducted in a single stage from Darwin to Adelaide. Once the teams have left Darwin they must travel as far as they can until 5pm in the afternoon where they make camp in the desert where-ever they happen to be. Other classes have different requirements, but all teams must be fully self-sufficient and for all concerned it is a great adventure – many say the adventure of a lifetime. During the journey there are 7 mandatory check points where observers are changed and team managers may update themselves with the latest information on the weather and their own position in the field. Here teams may perform the most basic of maintenance only – checking and maintenance of tyre pressure and cleaning of debris from the vehicle. There are also undisclosed check points which may be imposed by the event officials to ensure regulatory compliance. Will a future Leaf or Tesla be solar powered? Probablynot any time soon, but slapping solar panels on top of electric cars can only help improve their efficiency, extend their range and rely less on the grid. If it is any indication how far we need to go, the Prius had a short lived solar panel that only cooled the car.